Helllooooo, we're home off our hols, my did that do quick, and ready to start a fantastic run of workshops over the next two months around the country and a few other new ventures too which will be exciting. I'm off down to SirStampalot today for a demo day in true G45 style . I'll be using the latest collections to make some stunning altered art pieces and then tomorrow we have a full day workshop making the five gorgeous Mini Albums and altering the cabinet they go in Cats and Dogs style. I love these papers in the dark signature palette G45 are so famous for. Although I'm not the greatest of dog lovers I do like cats and without realising had picked out all the cat elements for some cards I made recently. If you'd like come along, join us and make the project, the workshop is being repeated in November. Call Janice direct at the shop for more info. Link above. this is stunning again Clare, so beautiful made and fabulous paper. What a super project. Have a great weekend. The whole collection is really gorgeous - love your selection of papers, I'm a cat lover too. I live in NW Ireland, a crafty desert, but I still manage to get hold of most things via t'internet and shopping channels (looking forward to the new one on 1st October). This is awesome! Is there a tutorial for this project? Oh Clare, I love the little cabinet that holds these little albums!! So cute, the drawers everything. Something has happened on my computer and I can't send pics at the moment but I wanted to show you what I did on that SteamPunk album, etc. Anyway enjoy the day and the ladies that you will be showing all these marvelous things to. 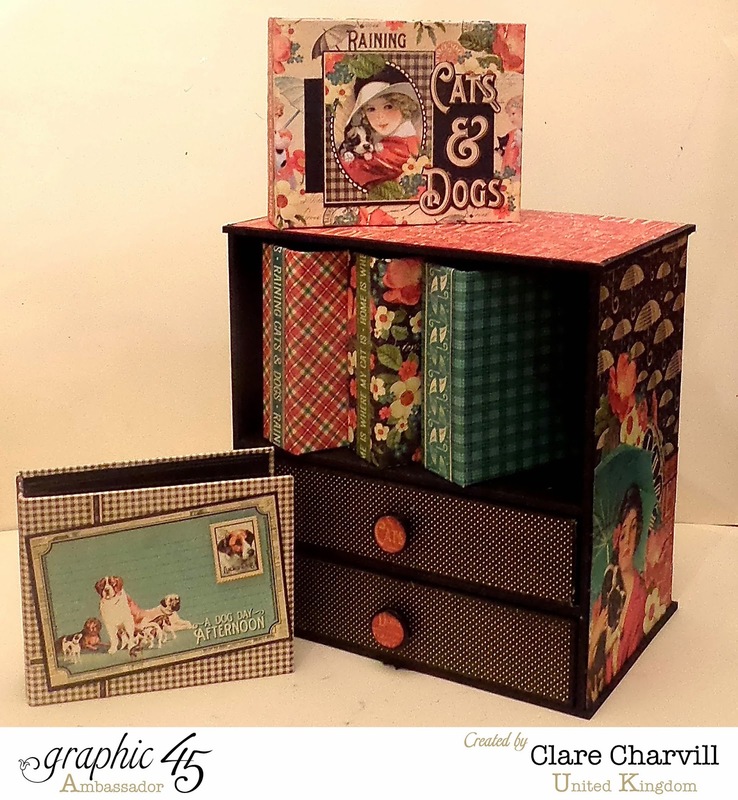 Hi Clare, This project is stunning, the papers you have chosen are really beautiful and work perfectly for this. You have such a good 'eye' for putting papers and colours together. Good afternoon Clare. Once again I'm bowled over by your amazing talent. This latest project is stunning and the papers too look fab! I haven't got around to getting these yet, but never fear they are on my "wish list". Thanks for sharing this and I hope you enjoy the rest of your day. Take care. What love papers and your inspiration is compelling. I am a big fan of yours since watching you on CnC and Graphic 45 for the first time last month. Love love love all the paper pads and all your gorgeous projects. Hello is this kit still available?